Some parts of the Brewers’ rebuild have been relatively easy. I mean, all trade negotiations are complex, but it was pretty obvious when it was time for the Brewers to trade Carlos Gomez, and they were inevitably going to get a strong prospect return. And, it was pretty obvious when it was time for the Brewers to trade Jonathan Lucroy, and they were inevitably going to get a strong prospect return. The Brewers did well with those moves, and now the Gomez trade looks even better, but just about any front office would’ve been able to help the organizational future there. The Brewers have done well elsewhere, too. With some of the more creative, lower-profile moves, the Brewers have helped to prop themselves up. Very quietly, they’ve gotten good production out of Jonathan Villar. I wrote not too long ago about why I’m a fan of Keon Broxton. The Brewers were smart to be in on Junior Guerra. They were able to turn Gerardo Parra into Zach Davies. A lot of the buy-low transactions have worked out, and there’s another name to add to the list. If you knew Hernan Perez before, it wasn’t for anything good. I’m not writing this for any urgent reason. Perez didn’t have a big game yesterday. He’s not a new young superstar, and he doesn’t even have a wRC+ of 100. Basically, I’ve just continued to run into Perez’s name over and over, when running various searches, and I grew tired of not addressing him. I made myself a physical note to write this post. I want you to be as aware of Hernan Perez as I have become. Perez is 25 years old, and he’s capable of at least occasionally playing shortstop. So, obviously, there’s something there. But last summer, the Brewers claimed Perez off waivers from the Tigers, and come November Perez was granted free agency. He re-signed with the Brewers organization, but it’s safe to say they couldn’t have been too excited about it. Otherwise, he would’ve been better protected. Perez made his big-league debut in 2012. Over his first four years, there were 594 position players who batted at least 250 times. Perez ranked in the bottom 10 in wRC+, at 45. He didn’t really walk, and he didn’t really homer. Versatile infielders who can’t hit are a dime a dozen. That’s why Perez was made available in the first place. Yet the Brewers must’ve liked him at least a little, and now he’s paying off, and then some. I’m not sure to what extent the Brewers saw this coming. Perez this season has appeared in 93 major-league games. His batting line is just about average, and after accumulating all of one home run in the majors before, this year he’s already hit 13. Hernan Perez is out-slugging George Springer. Very, very clearly, something has changed. You don’t fake this kind of home run. And as I can tell, Perez is just another leg-kick success story. There’s more to it — there’s always more to it — but Perez isn’t too small a guy. I’m sure he was long power-capable. Through old videos I’ve watched, I’ve seen a toe-tap timing mechanism, or a gentle leg kick. This year the leg kick is present and aggressive. It doesn’t work for everyone, but we’ve seen it work for a number of players, who subsequently saw their power spike. Perez goes on the list. He hasn’t become dramatically more fly-ball friendly. He hasn’t had a dramatic change in his contact rate. Very simply, Perez is just hitting the ball harder. According to Statcast data from Baseball Savant, Perez is tied for the 11th-biggest increase in average exit velocity from last year, out of 282. Remarkably, Perez isn’t only thriving to the pull field — he’s hit homers out to all directions. Perez is one of just 40 players with hard-hit rates of at least 30% to all three fields, given at least 50 batted balls to each. Perez has new power, and he can spray the ball. That makes him feel a little more sustainable. An issue for Perez is that he still doesn’t walk often. He is a naturally aggressive hitter. He can be exposed by good sliders, and he does make a below-average rate of contact. But, the contact rate isn’t that low. The power seems to be legitimately improved. 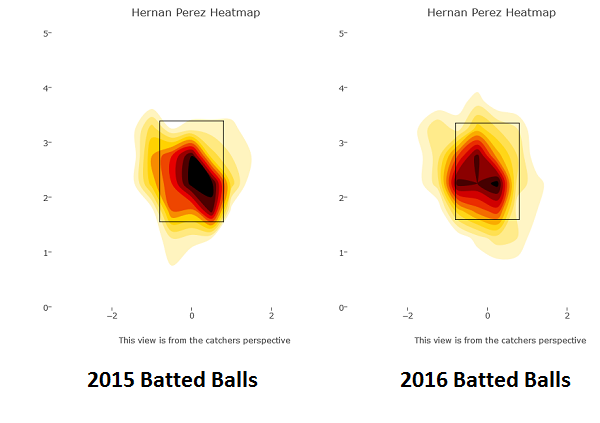 Perez’s own discipline has gotten better, in terms of identifying the pitches he wants to offer at. And going beyond just performance in the batter’s box, Perez this year has appeared at six different positions, plus he rates as one of the game’s top baserunners. He hasn’t hit into many double plays, he’s been pretty good at taking the extra base, and he’s stolen 26 bags in 30 chances. 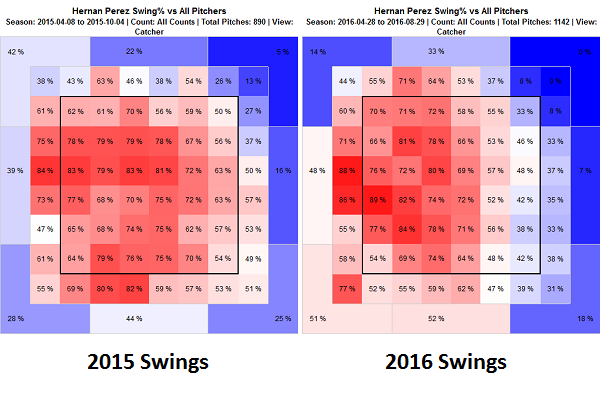 Perez can help all over the place, and along with Broxton and Villar, he’s always a threat to try to move up. It gives the Brewers’ offense a different dimension. As I said earlier, Perez is probably no blossoming star. They can’t all turn into stars. But Perez, at the very least, looks like a quality long-term utility sort, and he might be an actual regular. He’s significantly improved, and the Brewers were able to pick him up for nothing. In large part, a successful rebuild is about nailing the big trades for prospects. There’s still a lot more to it, though. And the Brewers’ report card is fantastic. We hoped you liked reading Chalk Up Another Brewers Buy-Low Success by Jeff Sullivan! You made an article about a SS with a well under 100 career WRC+ playing for a crappy team interesting.